We live in a post-Garden State world, where the the indie-rock romantic comedy has become its own sub-genre. These movies typically involve awkward, nerdy flirtation between characters wearing hooded sweatshirts who bond over the Shins/the Smiths/infinite playlists. Oh, and Michael Cera is usually the male lead. This Movie Is Broken looks to take that concept to the next level, as director Bruce McDonald combines a romance between twentysomethings Bruno (Greg Calderone) and Caroline (Georgina Reilly) with live footage from Broken Social Scene’s concert at Harbourfront Centre last July. Caroline, who Bruno has been in love with since childhood, is moving to Paris in 24 hours, so their relationship plays out over a single day, as the two make their way to the concert and attempt to finagle their way backstage with some help from Bruno’s friend Blake (Kerr Hewitt). This story is set against the real-life drama of the Toronto civic strike, with images of garbage piled high in parks setting a vaguely apocalyptic backdrop for their doomed romance. The film rarely stays on the protagonists for longer than a few minutes at a time, frequently cutting back and forth between them and the show. As the concert picks up steam and the clock winds down on the couple’s relationship, less and less time is devoted to the characters, with some of the film’s climactic scenes playing out as a series of quick cuts between the band and Caroline and Bruno. What becomes clear as This Movie is Broken goes on is that the storyline is secondary to the concert footage. 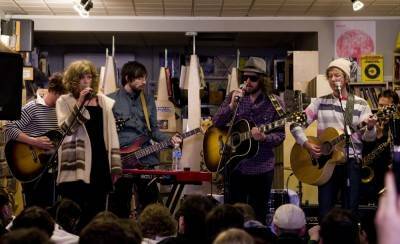 Nothing that the lovers do can match the intensity of watching well over a dozen musicians on stage, with Broken Social Scene’s core members joined by star-studded collaborators Feist, Emily Haines, Amy Millan, Jason Collett and more. Ultimately, This Movie Is Broken is more akin to a long-form music video than your average indie rom-com. The storyline doesn’t really matter, and the characters’ struggles are simply a vehicle to give the songs some emotional heft. This helps the film to succeed where other concert documentaries fail: it puts the concert in context, setting it against a backdrop of civic and personal conflict. As any music fan knows, a great show doesn’t begin when the musicians take the stage and end after the encore – it’s also about the venue, your concert companions and your emotional state. So even if it comes up a little short as a romance, the film’s ability to capture the extraneous situations that make up the concertgoers’ experience means that this is a must-see for indie rock fans. This entry was posted in Movies and TV and tagged indie-rock, Lisa Lobsinger. Bookmark the permalink.